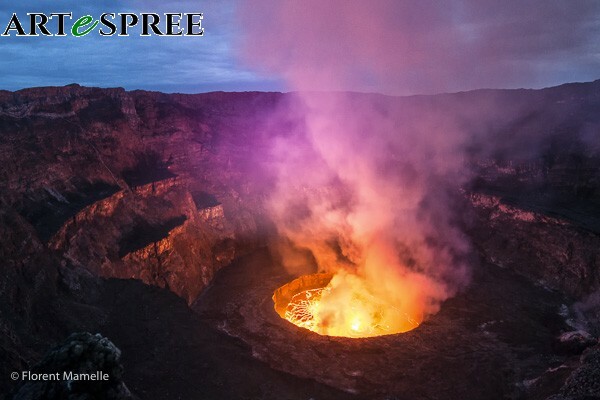 The Nyiragongo volcano has the biggest permanent lava lake on Earth. After the sunset, the red glow of the lava mixes with the blue of the sky, which creates this purple cloud. At the same time, the crater becomes red. These effects only last for a few seconds. Picture taken in June 2016 in Democratic Republic of Congo. About the “Land of Vulcan” series of pictures : This series of photographs is part of an exhibition which was held at Alliance Française Kuala Lumpur, 15 Lorong Gurney, 54100 Kuala Lumpur from February 11th - 25th, 2017. This is a celebration of the beauty of one of the last frontiers on Earth, out of reach to most of mankind: volcanoes. These pictures are an explosion of colours from Indonesia, Ethiopia, Republic Democratic of Congo, and Hawaii, which I took between 2011 and 2016. These pictures are a combination of colours, patterns and perspectives, with a mix of different elements : fire, water, gases and rocks. Taking pictures of volcanoes are usually challenging: freezing temperature or extreme heat, violent winds and deadly gases, exhausting climbs and sleepless nights. My fascination drove me as close as possible until my fear and reason told me to stop.